I have made two of these kites and they both function flawlessly. 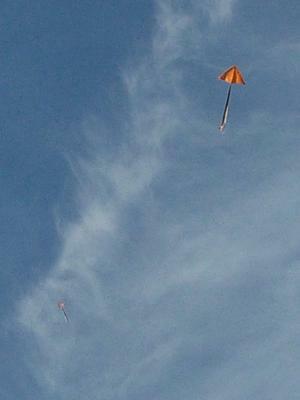 I was flying them on a Saturday evening with very little wind. One change I implemented was reinforcing the spreaders on both kites, since the one on the orange kite broke from a previous crash and needed repair. The kite that was made the other day (seen in the bottom left corner of the picture) was made out of a red and white striped plastic tablecloth. The tails are both three 5' streamers bundled together. While store bought kites were having trouble getting off the ground, both Deltas were up in the air in no time and climbed very high. The red and white Delta reached over 300 feet in the picture. The orange one had a shorter line and hovered motionlessly at 190 feet. Both kites flew steadily for an hour and a half until the sun set and the wind died down.